Choose File/Office button> Save As. PowerPoint 2010 and 2013 make this easier. Choose File> Save As. 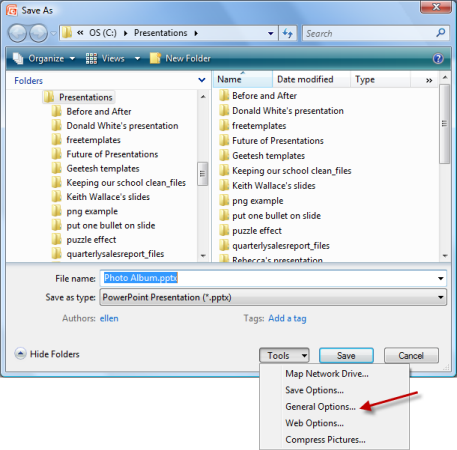 In the Save As dialog box, click the Save as Type drop-down list and choose PowerPoint Picture Presentation (*.pptx). That’s all there is to it! In PowerPoint 2010 and 2013, choose File>Save & Send> Create PDF/XPS Document>Create PDF/XPS. In PowerPoint 2013 and 2013, choose File, Export/Save & Send, Create a Video. 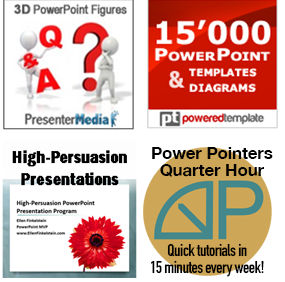 PowerPoint 2010 creates a WMF video and 2013 creates an MP4 video. Video capture, including TechSmith’s Camtasia, SnagIt (in video capture mode). These tools convert to AVI, SWF, MP4 or other formats. There’s a free open source option, CamStudio. PowerPoint 2007 and later allow you to add a password that allows people to open, but not edit, a presentation. This is a great way to allow some people to edit the file, but not others. But note the “gottcha” and the workaround at the end of this section. Click the Office/button/File> Save As. In the Save As dialog box, choose Tools> General Options. In the General Options dialog box, enter a password in the Password to Modify text box. Be sure to write this down! Click OK. You’ll need to re-enter the password. Then go ahead and save the file. When you or others re-open this file, a dialog box appears asking for the password. The problem with this method is that if people open the 2007 or later file in PowerPoint 2003, the file is no longer protected. However, funnily enough, if you save the file in 97-2003 format (in the Save As dialog box), you can’t edit the file, even in 2003. This workaround may be just what you need. Of course, some features of 2007 and later don’t work in 2003, which may be a problem if you want to give some people the right to edit the file. PowerPoint 2007 and later let you add a digital signature to a file. A digital signature doesn’t prevent changes but lets you know if someone has changed the file, because the process of changing the file invalidates the digital signature. You need to purchase a digital signature service. In PowerPoint 2007, start by choosing Office button> Prepare> Add a Digital Signature. In PowerPoint 2010 and 2013, choose File> Info> Protect Presentation> Add a Digital Signature. If you have 2007 or later and don’t need to securely prevent changes, but just want to let people know that a presentation shouldn’t be changed, you can use the Mark as Final feature. In 2007, choose Office button> Prepare> Mark as Final. In 2010 and 2013, choose File> Info>Protect Presentation> Mark as Final. This turns off all typing, editing, and proofing commands. However, someone can go back to the same menu item and turn off the setting, so use this feature when absolute security isn’t necessary. How do you protect PowerPoint files from changes? Leave a comment! Hi! I use PowerPoint for Mac 2011 and could not use its protection since I could not connect to the Rights Management Services due to no connection (although my modem is ON). What should I do? Thank you. I have no idea; perhaps another reader will know how this works on the Mac. Also, Microsoft has a PowerPoint for Mac “Answers” forum. Go to answers.microsoft.com and search for PowerPoint and Mac or more specifically for your issue. 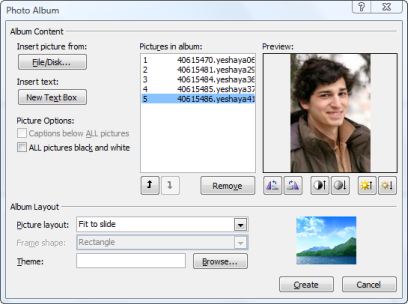 The “Convert to images” method can be as easy as right-clicking on the presentation file and selecting a menu item with PowerPoint Presentation Rasterizer: http://j.mp/pptraster (it is free and open-source). Additionally, it can preserve transition effects between slides. It is only 8 kb and does not require admin rights. Thanks! Excellent information and very friendly. keep posting information related to powerpoint presentation, as I am working as a market analyst for a distribution company, which deals in both food and non-food products. I prepare and present monthly presentations. Hi Ellen, a lot of thanks for your help. It helped me a tons….. I’m very glad that you share this. Gbu.. Thanks so much. I put my PPTs online for students but really don’t want them editable, but to still have all the features of the animations. Your advice is great! I was also thinking of selling some on TeachersPayTeachers.com but didn’t want them editable. This maybe the solution!! Thanks again. Thank you! This was really helpful information. It worked just as you indicated. Was looking for protect the ppt from modification on Office 2013. Got help from “Password protect for editing” section..thanks a lot. I have documents but are read only MS power point (2013). I could not copy and could not save as. Only and only read nothing else. These files are in USB. Any one know about. Thank you so much I never knew what that tools button in the save dialog did until today! Your information was every helpful! Wow, thanks! I could not find this information on Microsoft’s site, so I appreciate you posting it in a format that the search engines can find. Thanks for so many great tips. I was wondering, is there a way to protect the PowerPoint file from changes, but still leave open the possibility of adding comments? It would really help if people couldn’t just roam around in my presentations, but they may tell slide by slide what changes they would like to see made. Thanks. For that, I would probably export as PDF and have the people add the comments in Adobe Reader. You might have to show them how. Thank you so much for answering. I’m going to look at that and see how it works. It’s new for me too. I created a ppt set of slides, sent it to have it put into a video. It is 10 modules of image slides returned to me? I want to make changes to some content and need to add a slide, but it is in read only, so what can I do to be able to make changes? or what is the easiest way for me to just recreate the whole ppt which is easy part, but want the same photo images which I do not know how to do? I can’t tell what the problem is without seeing the presentation. Are you using unusual or privately-bought fonts? Try basic fonts and see if they carry over. Again, I’m not sure what would cause the layout to change. I’ve never seen that. Try a simple slide and use one of the layouts without changes and see if it goes to PDF properly. Also try a different method of creating the PDF — you can use File, Export or Print to a PDF Driver. Finally, try from a different computer. With these steps, you’ll start to figure out where the problem is. I am trying to save my PowerPoint so that slides, images and text cannot be copied. However, I want text boxes available for others to add their own text. How can I do this? You would have to save the presentation as images and insert text boxes on top. Of course, the images could be copied, but they wouldn’t be editable.